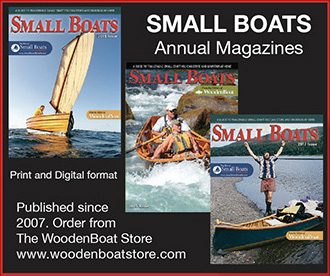 I had to take the Forward-Facing Rowing System apart to make a change before I fit it to my Whitehall, and in the process of removing the 8 stainless-steel nuts and bolts, I found that seven of the nuts wouldn’t budge, and the only way to remove them was to twist until the bolts sheared. I may have twisted an odd bolt or two off in the past and chalked it up to corrosion, but to have seven out of eight new bolts go was odd. (In defense of the Forward-Facing Rowing System, the change I made was unique—the bolts don’t normally need to be removed.) I thought the ends of the bolts might have been damaged, but some of the bolts that sheared had several threads extending out of the nut and they looked like they were in good condition. I didn’t try a shot of WD-40—there wasn’t any sign of corrosion. I bought a new set of bolts and nuts and gave them a smear of anti-galling goo before I installed them on the rig. In the future I’ll used the goo more regularly to save a few bucks on ruined fastenings. After I’d bought the replacement nuts and bolts, I was on my way out of the hardware store with a handful of stainless steel just as another customer who was about to leave came up behind me. I waited a moment and held the door open for him. He went through without saying thank you or even putting a hand on the door. He passed by me less than a foot away but didn’t even look at me. Now that’s what I call galling. 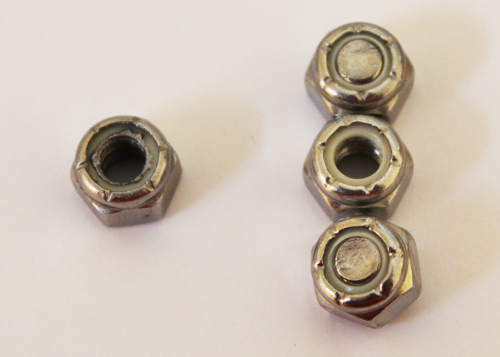 I don’t often use distorted-thread locking nuts, but the ones I’ve seen are the type with an indentation on the side. 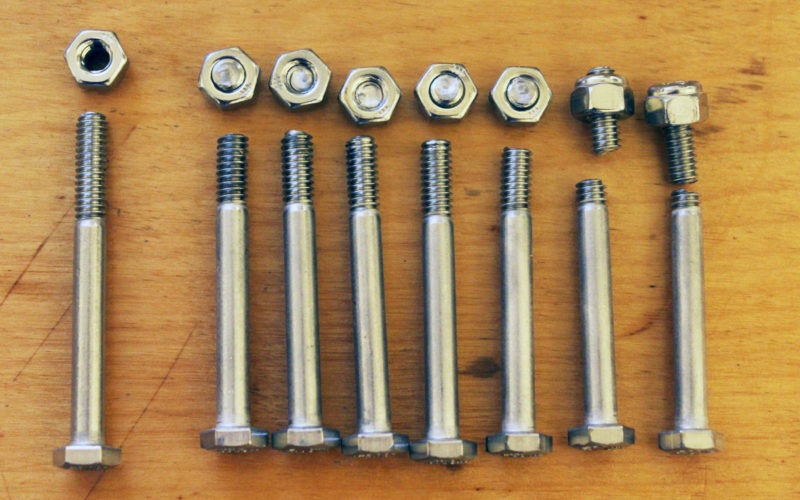 I’ve done something similar with ordinary nuts by tapping a fine-pointed nail set to make a dimple or two in between the top of the nut and the bolt. While thread-distortion nuts cause friction to keep them in place, it’s my understanding that there’s not so much friction that the nut can’t be installed and by the same token, not so much friction that the nut can’t be removed. They may have used LockTite thread lock on them. Sometimes a little heat will loosen the bond, otherwise the bolt will break off. Here’s a closer look at one of the nuts. At “D” there are threads that appear to be clean. I don’t see any residue of any material on any of the nuts or bolts. At “A” there’s a dark line that is the gap between the sheared end of the bolt and the nut. At “B” that line ends and at “C” the metal appears to be smeared; there is no discernible gap between the metal of the bolt and that of the nut. There’s another nut where the bolt broke off at the second thread inside the nut and it too has places where the gap ends and the metal bridges the bolt and nut without interruption. It looks welded to me. I too, have experienced galling but it seems only to occur with certain metals, namely aluminum and stainless steel. I have never experienced this with tool steel or galvanized nuts and bolts. I know from work many years ago in a metal fabricating factory that SS will tear and is particularly hard on dies and punches. 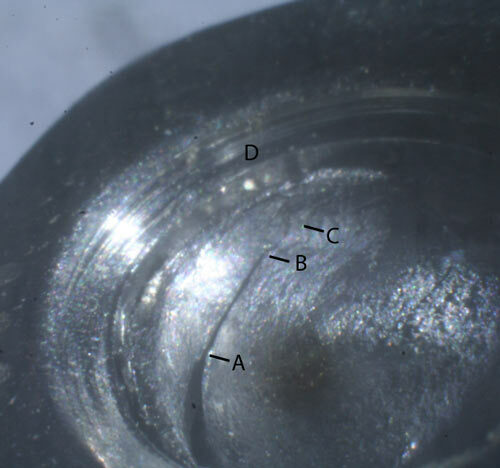 I have often noticed that a punched hole in SS sheet will very often have a significant burr on the underside indicating that the “plug” has torn slightly as it was pushed out of the parent sheet. It is this malleability I believe, that causes the metal of the two parts under pressure-stress to marry or bond and become inseparable. The cold swaging of SS fittings to SS wire products actually bonds the two metals together as surely as if they had been welded. It is the same process being exhibited with the bolts.